Well, they are over here actually (though I promise there will be regular updates here again as well as soon as that other site is up and running nicely). Enchanted is one of those movies where you almost have to appologize when you tell people that you love it. Colleagues raised their eyebrows and inquired: "Wait, isn't that a kids movie?" while friends shrugged and said: "It's that same type of girlie princess stuff you always try to recommend to us." But even when I frown at most girlie princess stuff (I had to turn off that Barbie Mariposa animated drivel I was sent to review five minutes in, luckily my daughter didn't mind), Enchanted is just a lovely, funny and very likeable movie I can see myself watching over and over again. The highlight of the film is maybe even the animated seven minutes in the beginning, which looks so great I cannot wait for The Frog Princess to come out next year. So let's get the girlie princess stuff out of the way: Giselle is a regular girl living in the countryside in an animated world. Animals love her, and whenever she starts singing they gladly do anything for her that she wants, which is more or less in keeping with Disney princess tradition (take Cinderella for instance). She is hoping that one day a prince will come to swoop her off her feet (Snow White) and lo and behold, up rides Edward, who immediately falls in love with the girl and asks her to marry him. Edward's mother, Queen Narissa, is not so pleased. The thing is that she will have to leave the throne on the day her son gets married, and so she disposes of Giselle by throwing her into a wishing well. This well leads to our non-animated New York city, where Giselle has to find a way to get back home, to her prince. After a bewildering first few minutes, she runs into the real world's very own McDreamy, Patrick Dempsey, who plays Robert, a single man living with his daughter. This Robert is a man who only believes in hard work and punctuality, and who plans on proposing to his girlfriend when it's convenient to do so, not because of some silly little thing called love. Giselle is shocked, like Robert is shocked when he hears Giselle agreed to marry Prince Edward on the first day they met. Meanwhile, Edward is on his way to rescue Giselle, followed by Giselle best friend Pip the squirrell, as well as his personal aide Nathaniel, who has been ordered by the princess to get rid of Giselle before she finds her way back. The fun part of this movie is not just the way it gently makes fun of Disney fairy tale conventions. As a matter of fact, Giselle is so lively and loveable that you cannot help but take a shine to her old fashioned thoughts about love and romance. The biggest fun comes from the way the main actors completely throw themselves into their roles. I had never seen Amy Adams in a movie before, but after seeing this, I cannot wait to see her again. She's really like a fairytale princess come to life, and I can understand why everybody in this movie falls head over heels in love with her. And James Marden is an unexpected surprise as Edward. Normally, he gets handed the 'other man' roles, and even though that is basically also what he gets here, he still has so much fun with his role that you almost feel like you are watching Cary Elwes let loose in Princess Bride again. He's terrific, and I hope to see him in this type of role more often. Patrick Dempsey is his usual charming self as Robert, while Timothy Spall is his usual smarmy self in the role of Nathaniel. And Susan Sarandon clearly had a ball acting the role of evil queen, even though her role isn't as big and menacing as you probably would expect. Most of the attention in this movie is focussed on Giselle, and you cannot really blame the director for that when you have such an amazing lead. The movie is littered with in-jokes and catchy songs (not too many, luckily), and will cheer up even the grumpiest of gusses. It is a shame, maybe, that in a movie this refreshing, the ending is so expected. I had a discussion with my wife halfway through the movie, during which I predicted to her how the movie would end, and she more or less made fun of my predictions, expecting a bit more originality from the filmmakers than that. I hoped she was right, but alas, I was right, which was a bit of a downer. Not a big enough downer, however, to make me lose the wonderful mood I was in after consuming this fluffy bit of cinematic cotton candy. 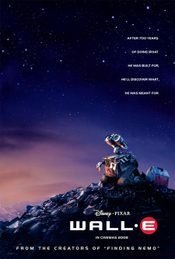 After the previous two trailers for Wall.E, and all the images and info about it,I thought my anticipation for this movie had risen to levels which could never be higher. So here is the third trailer, and now the anticipation levels are getting ridiculous. This trailer gives us a lot more info on what the movie is about, thanks to a voice over detailing the back story, and many scenes of Wall.E in other places than on earth. We also get to see Wall.E’s ‘girlfriend’, a sleek little robot that looks like it could have come from the Apple factories. The scenes with Wall.E and his girlfriend are adorable, while the other scenes reveal a story that has adventure, comedy and inventiveness. Warning: watching this trailer will make you wish time travel was invented so you could travel a bit forward and have a look at this pic already. I'll admit that after Lady in the Water, I was a bit afraid M. Night Shyamalan had lost his touch. The movie is bad in a hilarious way, and it made you wonder how it was possible that this talented man had all of a sudden lost his ability to direct a movie. So I don't know if this has to be credited to the people who cut the trailer for his new movie or not, but The Happening looks like it could be a great return to form. The concept of the movie is really brilliant, but since the trailer doesn't really explain it, I won't go ahead and spoil it either (you can always look it up on the IMDB). What the trailer does reveal, however, is that something is very wrong. All over the world, people are mysteriously dying. Chemical attacks by terrorists are offered up as the reason, but it soon becomes clear that other forces may be at work here. The trailer is excellent at building up the tension and gives you a few clues about what you can expect. Personally, I am especially curious as to wether or not that huge blue ring Mark Wahlberg is wearing in the trailer has any significance for the rest of the movie. 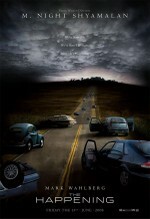 The Happening looks like it will be a big disaster movie with a difference, so I'll eagerly anticipate its release in June. ...Most importantly: The Coen Brothers. The brothers took some of the most important awards, being Best Movie, Best Adapted Screenplay and Best Director. So yeah, I guess the Coens were pretty happy, although you wouldn't know it from the nonchalant way they accepted their awards. Kudos to them, and also thank you very much, since I predicted all three of their victories in the Oscar pool at work. Of course, as usual, I didn't win it, but for a change I came second and didn't finish hopelessly last. Least unexpected victory: Ratatouille. I haven't seen Persepolis yet, and am pretty sure it's a wonderful movie, but can anything really beat this Pixar masterpiece? Hey, I do know her! : When I saw her name on the list of nominees, Marion Cotillard didn't ring a bell. Then I saw her accept her award and had to dash over to the IMDB to check if I was seeing things right. And yes, she is the girl from the French Taxi-movies (couldn't find a subtitled version, sorry)! Also completely expected: Daniel Day Lewis for Best Actor, Javier Bardem for best Supporting Actor and Diablo Cody (Juno) for Best Original Screenplay. Three Oscars for Bourne? I haven't seen the third part in this very enjoyable series yet, but giving it three awards smells of the type of we-havent-given-the-first-two-movies-any-awards-so-lets-give-some-to-the-third-part practices that propelled the third Lords of the Rings movie to victory. When Alles is Liefde was released in cinemas, it exceeded every expectation. It attracted more visitors than any other Dutch movie had done in the past fifteen or so years, crossing the 1,3 million visitor mark with what seemed like incredible ease. It was the must see movie in a period when Dutch movies were slowly becoming more and more interesting for Dutch cinemagoers again. There was a time when Dutch movies played mostly to empty seats, but now, more and more Dutch movies reach big audiences. This seemed to culminate with Paul Verhoeven's Zwartboek (Black Book), which was the first Dutch movie in a long time to cross the 1 million visitor mark, and now Alles is Liefde. And for international readers who have never heard about this movie, here's a fact that might interest you: both of these movies star Carice van Houten. I think I've seen approximately 9.564 teenage comedies in my life (give or take a few...), so you could say I am somewhat of an expert on the genre. It all started with Porky's and Animal House, which I both saw on grainy video copies in the early days of home video recorders, and has continued with movies like Can't Buy Me Love, Ferris Bueller's Day Off, American Pie and 10 Things I hate about you. I'll admit that out of all those teenage comedies I have seen, most of them were either boring and cliched or awful and cliched, and only rarely do you get the chance to see a movie of this sort that is actually in the slightest possible way original. 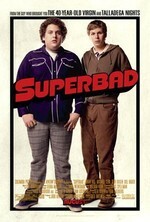 Especially in recent years, the genre has been murdered by uninspired movies one after another, which is why Superbad was such a shock. Here is a teenage comedy that is not only fun to watch and a breath of fresh air, but which might actually be one of the best movies in the genre I have ever seen. 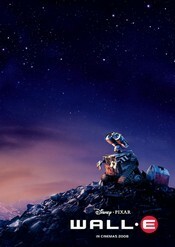 If you're an American, you have probably seen both the Super Bowl and this new Wall.E TV-spot already. But if, like me, you're not, or if you saw the game on a station that showed its own commercials, then here is a chance for you to see the spot after all. It's pretty funny and even features Buzz and Woody out of Toy Story, which is a nice bonus. Now I have no idea whether or not this is actually really Kirsten Dunst, or if this is just some sort of parody. But if it is the Spider-Man actress in this clip, then it's pretty scary. What we have (or haven't) got here is a clip of Dunst, aged 13, being prepared by her parents for some television interviews she is going to give. Kirsten is obviously not really in the mood for the interview, as she clearly expresses to her parents. There's nothing wrong with that, but what is wrong is the way her parents are trying to groom her to say things she does not want to say. If it's the real thing, it's a pretty revealing look at what life is like for a young actor or actress. And if it's not real, then you can probably still get a laugh out of Dunst's remarks about Tom Cruise.